Too early to talk about trends, but the 2018 study validates previous findings. BOULDER, Colo. (BRAIN) — Sometime next year, PeopleForBikes will release its fourth Bicycling Participation Study results and the organization's research director, Jen Boldry, will be ready to talk about trends in bicycle use in America. BOULDER, Colo. (BRAIN) — Wholesale bike sales were down in dollars and in units in the first two months this year, compared to the same period last year. Year-to-date figures through November show a 4 percent increase in dollars and a 9 percent decrease in units. BOULDER, Colo. (BRAIN) — While year to date figure are mixed, wholesale bike sales dipped in November, down 14 percent over the same month last year in dollars and down 26 percent in units. E-bike sales up 46 percent year to date. BOULDER, Colo. (BRAIN) — U.S. wholesalers sold 7 percent fewer bikes through the first 10 months of 2018 compared with the same period last year. But the dollar value of those bikes was up nearly 6 percent, reflecting a higher average cost per bike. WASHINGTON (BRAIN) — The latest figures from the National Highway Traffic Safety Administration show an 8.1 percent decline in cyclist deaths due to motor vehicle-related incidents last year, compared with the prior year. E-bikes and disc road bikes also driving sales, contributing to 3% growth in IBD revenue. 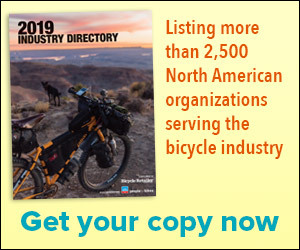 BOULDER, Colo. (BRAIN) — Retail sales of 29-inch mountain bikes grew $36 million in the 12 months ending in June, taking dollar share from 27.5-inch bikes, according to The NPD Group. Twenty-niners now account for 41 percent of dollars sold in mountain bikes at IBDs. Recent bike category trends continue: BMX and e-bikes are growing, along with full-suspension mountain bikes and gravel bikes. BOULDER, Colo. (BRAIN) — Bike shipments to dealers were off 5.6 percent through July, or 77,329 bikes fewer than the same period last year. But there was good news: dollar business was up $43.4 million to $667.5 million year to date. BOULDER, Colo. (BRAIN) — There are more than a few surprises contained in VeloNews' recent Audience Study, which surveyed over 5,200 of the media brand's readers and online followers in what the magazine's publisher is calling "by far the most detailed media audience survey done in the bike industry in at least 25 years." BOULDER, Colo. (BRAIN) — Bicycle Product Suppliers Association members shipped 218,741 bikes to retailers in April, up from 217,980 for the same month in 2017, a nominal 0.3 percent increase. But dollars were way up, about 14 percent month on month, accounting for $114.7 million. MOUNT PROSPECT, Ill. (BRAIN) — Participation in team sports by children age 7-17 showed a 5.8 percent decline last year according to the latest data released by the National Sporting Goods Association. BOULDER, Colo. (BRAIN) — The U.S. bike industry saw a slight uptick in wholesale sell-in in the first quarter, driven by increases in sales of e-bikes, gravel bikes, and BMX. The dollar value of the bikes sold in to retailers in the first quarter was $229 million, up 2.4 percent from the same period last year. BOULDER, Colo. (BRAIN) — Market research company The NPD Group is holding a complimentary one-hour webinar next week to go over cycling trends the company identified in 2017. MOUNT PROSPECT, Ill. (BRAIN) — Early figures from the 2018 edition of the National Sporting Goods Association's Sports Participation in the U.S. report shows participation in the study's "Wheel Sports" category, which includes cycling, remains flat, up just 0.1 percent over the prior year.